If you live in Calderdale and find you can’t afford to warm your house, you may be eligible for help from Safe & Warm Calderdale. 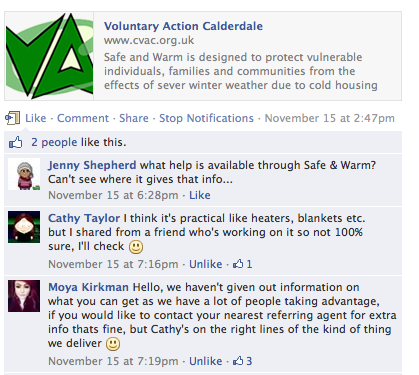 You need to ask one of the referral agencies to refer you to the Voluntary Action Calderdale, who run the scheme. You may be eligible for Energy Company Obligation (ECO) help to make your home warmer. The ECO requires the big six energy companies to help some customers make their homes warmer and more energy efficient, by installing free insulation and heating in their homes. The energy company will determine how much subsidy they provide to each customer they help. To find out about eligibility and how to access the ECO, you can phone the Energy Saving Advice Service on 0300 123 1234 for free and impartial information. There are three types of ECO, all offering help with improved home heating or insulation. If you receive some specific means-tested benefits and are a tenant in a privately-owned house (not in social housing), you may be eligible for free heating and insulation improvements through the Affordable Warmth Obligation. This is for people on a low income who are vulnerable to the impact of living in cold homes, including the elderly, disabled and families. The latest Autumn budget statement (2013) has taken responsibility for funding the Affordable Warmth Obligation off the energy companies so that it will be paid for out of public funding (from taxes). Don’t know yet what effect that will have on how people will access the free heating and insulation improvements. This helps towards the cost of insulation measures, such as solid wall and hard to treat cavity wall insulation, that are too expensive to be funded through a Green Deal loan. It is not means-tested. George Osborne’s Autumn budget statement has reduced the Carbon Saving Obligation so there will be less help available for solid-wall and hard-to-treat cavity wall insulation. This is for people who live in Rural and Low Income Areas and who need to make their homes more energy efficient so that they can stop living in fuel poverty. If you live in a rural area, defined as a settlement of fewer than 10,000 inhabitants, your household may be eligible for a grant if you are on a low income and in receipt of one of qualifying benefits. In the Upper Calder Valley, people on low incomes and one of the qualifying benefits who live in the Low Income Areas of Sowerby Bridge and Todmorden wards are eligible for CSCO help to make their homes more energy efficient. This applies whether people are tenants or homeowners. Between 25,000 and 30,000 people die each year of cold in the UK. The level of “excess winter deaths” in the UK is higher than in Siberia – and about twice as high as in other parts of Northern European like Scandinavia and Germany. This is down to the generally poor quality of our leaky, damp, draughty housing stock. Nearly 8,000 of these deaths are attributed to fuel poverty. This is currently defined as having to spend more than 10 per cent of your income on keeping your house at a decent temperature: 21 degrees celsius in the main living room and 18 degrees in other occupied rooms and parts of the house. However, the Department of Energy and Climate Change (DECC) is proposing to change this definition (see below). The Energy Saving Trust (EST) estimates that in 2011, 6.4 million UK households were in fuel poverty. This is around a million more than two years ago and more than 4.4 million more than in 2003. Fuel poverty is caused by a combination of low incomes, high fuel prices and energy-inefficient homes that take a lot of energy to heat. The 2011 rise in fuel poverty is down to rising energy prices, inflation and falling incomes – as many people have lost their jobs and unemployment is high. 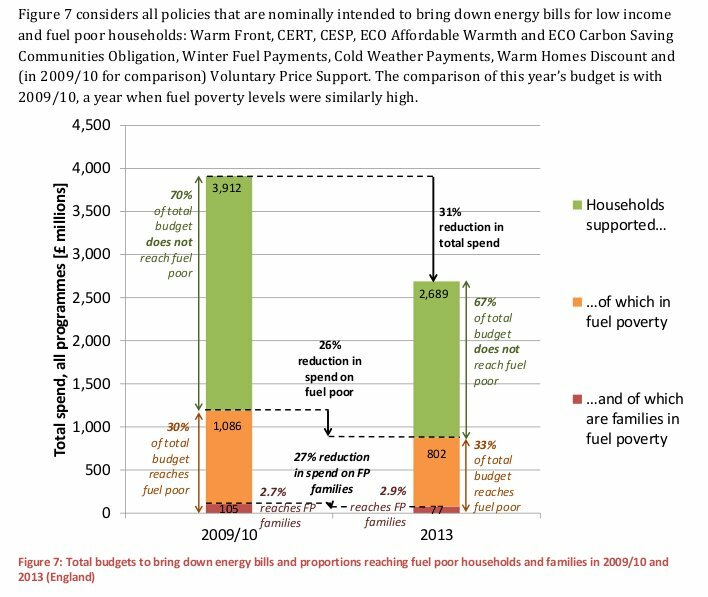 Is the government serious about eliminating fuel poverty? The Warm Home Discount Scheme aims to help around 2 million low income and vulnerable householders a year with their energy bills, until March 2015. The Winter Fuel Payment helps pensioners pay their winter energy bills, and the Cold Weather Payment goes to vulnerable people on income-related benefits. However, the Cold Weather Payment is not a very effective way of tackling fuel poverty – according to the Association for the Conservation of Energy, although nearly 70% of the government’s fuel poverty budget for 2013 will go on Winter Fuel Payments, only 12% of the recipients are thought to be fuel poor. The government predicts that, by 2023, the ECO programme will have alleviated fuel poverty in between 350,000 and 550,000 households – around ten per cent of those currently fuel-poor in the UK. What about the other 90 per cent? In 2012, the Department of Energy and Climate Change (DECC) invited people to comment on its new plans to change the way fuel poverty is measured in England. The consultation closed on 30 November, and DECC aims to publish its response early in 2013. One of the questions DECC asked people to comment on is whether there will need to be a change to the government’s current target of eradicating fuel poverty by the end of 2016. This is because DECC thinks the proposed new definition of fuel poverty “ may not align with the target as it currently stands.” Are these weasel words? The Association for the Conservation of Energy is scathing about DECC’s consultation. The Centre for Sustainable Energy has published its response to the DECC Fuel Poverty Consultation. It says the proposed new definition “is not helpful“. It notes that it would remove £1.3m households from being considered as experiencing fuel poverty and proposes a more inclusive definition of fuel poverty as “all households or persons that cannot afford their fuel costs due to a combination of low income and inefficient housing“. Why change the definition of fuel poverty? DECC’s plan is to move away from the current definition (where households that have to spend at least 10 per cent of their income to keep their homes at a decent temperature are considered fuel poor), to a system proposed by Professor John Hills, from the London School of Economics. His review of fuel poverty suggested the use of a ‘low income high cost’ indicator. This would show whether a household has current ‘required fuel costs’ that are above average, and whether its income excluding housing and fuel costs is below the average poverty line. Professor Hills thinks that the current definition of fuel poverty measures it in the wrong way, and doesn’t identify the main causes of fuel poverty. His review says the main causes of fuel poverty are “a combination of low incomes and high costs driven by poor energy efficiency and high energy prices” and that the most cost- effective way of reducing fuel poverty is to increase the thermal efficiency of houses (ie insulate them). My view is that, since low incomes are a cause of fuel poverty, reducing it could also be achieved through making sure that jobs pay a living wage, and moving away from the current low wage economy. As well as redefining fuel poverty, the Hills Review proposes a different way of measuring the extent of fuel poverty – the fuel poverty gap. This calculates the difference between a household’s current required fuel costs and what these costs would need to be for it not to be in fuel poverty. Adding together each fuel poor household’s fuel poverty gap would give a national fuel poverty gap, showing the scale of the national problem as well as individual households’ problems. Using this approach shows that 7.7 million individuals in 2.7 million households were fuel poor in 2009. The average fuel poverty gap for each household is £415, giving a total fuel poverty gap of £1.1 billion. This number of fuel poor households is a far lower figure than the 3.96m fuel poor households in 2009, shown in DECC tables based on the current definition of fuel poverty. This entry was posted in Energy and tagged ACE, DECC consultation, fuel poverty, Hills Review, Safe & Warm Calderdale by jenny. Bookmark the permalink.